THIS PAGE MAY BE OUTDATED – This article is in parts, or in its entirety, outdated. Despite all of the climate protection initiatives that have been put into action, energy consumption continues to grow – not just in the UK, but worldwide. More than a third of global energy consumption is being used for the heating and cooling of buildings and this is where we can all play our part to make a big difference, not just for the sake of the climate but also for personal savings. If you think about how to save energy at home the first thing that comes to your mind is probably an elaborative refurbishment project. Whether it’s heat insulation, energy efficient boilers or solar thermal technology, there are many things you can do. But these often constitute a lot of work and high costs, which make these options unattractive to the majority of people. For those who are renting, living on a small budget or simply looking for something that can be done quickly with minimal effort, another solution is needed. We looked into the different types of investments and savings and a clear winner emerged. Intelligent heating controls enable people to significantly shorten their energy consumption with minimal effort, so it’s no surprise that they are becoming an ever more popular option. The tado° Smart Thermostat, for example, automatically controls the heating by using the residents’ location. It also takes other energy saving elements into account, such as your building’s unique characteristics and weather forecasts. 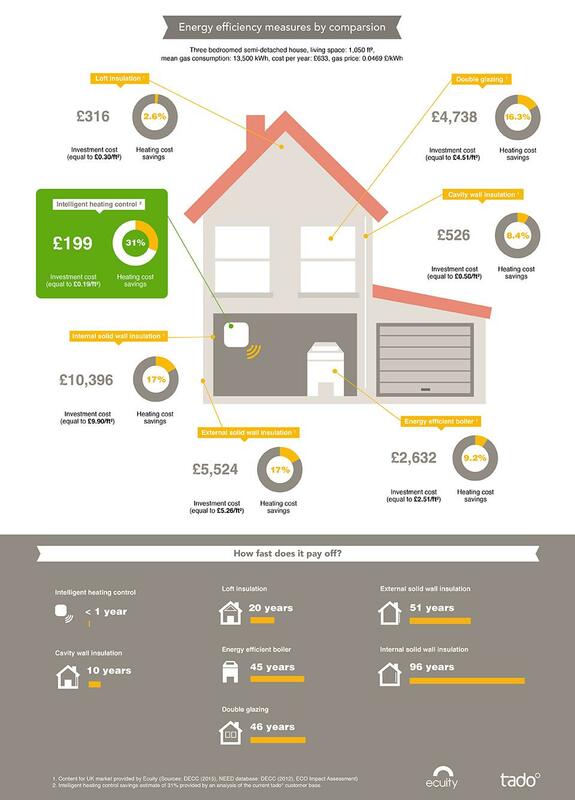 The results are remarkable: A household can save up to 31 per cent of its energy use by using the Smart Thermostat. * If you already have a room thermostat all you need to do is simply replace it with the Smart Thermostat. tado° works with almost all heating systems and manufacturers and only a few steps are necessary to start living a cost and energy efficient life. With the tado° Smart Thermostat you’ll soon get a return on your investment. It also helps you to achieve a first class A+++ EU label – awarded only to the most energy efficient heating systems. So why spend loads of time and money on a big refurbishment project when the smartest solution happens to be the quickest, the least expensive and the easiest to implement? Curious? Click here to find out more about the tado° Smart Thermostat.